safe & efficient employees for your company. can bring to your team. Safety Audits, Job Hazard Analysis, Rescue Systems, Customized Work Plans, Documented Authorized User & Competent Person Training, & Technical Rigging for any situation. Because safety, quality, and efficiency are top priorities for Safety Green High Rise Rope Access / RDS Training, owner/operator Jeff Scott maintains the highest possible standard in documented training and certification for his team. Safety Green High Rise Rope Access / RDS Training is able to provide work site Safety Audits, Job Hazard Analysis, Rescue Systems, Customized Work Plans, and Technical Rigging for any situation. 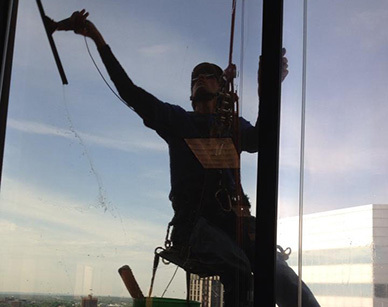 Safety Green High Rise Rope Access / RDS Training has made it a goal to be on the forefront of window cleaning regulations and safety on the national level. Jeff has held an elected seat on the Board of Directors, for the International Window Cleaners Association (IWCA) and served as Secretary for the organization in 2013. 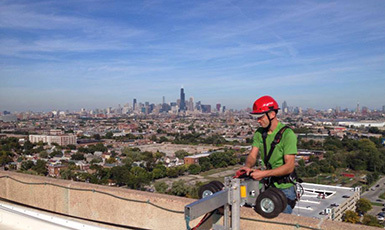 Jeff also holds current Level II Rope Access Technician Certifications from both the Society of Professional Rope Access Technicians (SPRAT) in North America and internationally from the Industrial Rope Access Trade Association (IRATA). As a sought after safety expert and trainer, Jeff has travelled the country to perform hands on self-rescue demonstrations at several IWCA regional safety training events yearly. 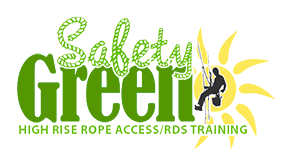 Safety Green High Rise Rope Access / RDS Training is happy to offer its expertise and experience to your company as well. If you have a project or team that could use some specialized training, leadership, or would just like to receive a quote on subbing it out. Contact us for a customizable quote. Safety Green High Rise Rope Access/RDS Training brings their training program to you or you can attend one of our Open Enrollment Training Classes held throughout the year. High rise rope access and RDS training.